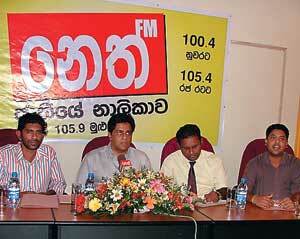 Veteran actors Sanath Gunatilake and Kamal Addararachchi have joined 'Neth FM' to promote cinema and literature through radio. Sanath, will appear in the evening programme 'Ridi Nimnaya' every Friday from 7 to 9 pm with entertaining and educative information related to cinema. The programme is to feature a variety of artistes including veteran filmmaker Sumithra Peries, actress Malani Fonseka, script writer and director Tissa Abeysekera while box office record producers like Neil Rupasinghe are also to take part. 'Ridi Nimnaya' is the first radio programme conducted by the acclaimed actor who has won a number of awards. Speaking about his selection for the programme, Sanath said educating the film audience through other media is very important for the development of cinema. "Even though our cinema has given less attention to the film sound, the medium of sound or the radio is a very powerful channel to reach the audience," he added. Actor Kamal Addararachchi is to voice the role of Sarath, the main character Sarath in the radio drama based on Kumara Karunaratne's novel 'Rathu Rosa', (Red rose). Kamal played the same role when the novel was made into a television drama. The drama will be aired everyday from 2 to 4 pm on Neth FM. The programme is a follow up of earlier radio dramas based on the famous novel 'Golu Handawatha' (Silent Heart) and 'Gehenu Lamai' (Girls) by Karunasena Jayalath. "Twenty years ago I worked as a radio artiste but the present role as Sarath is going to be a challenging one," said Kamal describing his role.Asanka Jayasuriya, Chief Executive Officer, Neth FM describing the aim behind the novel programme said "Neth wants to support and promote not only cinema and radio drama but other mediums like music and theatre.